Whether its Friday night at the Parade, Saturday at The Bay, or Sunday at Alberton, simply choose your game at any local ground, scan in using your membership card to six minor round games, and enjoy getting up close to the best local footy competition in Australia. Then come September, take advantage of your access to all SANFL Finals and the SANFL Grand Final played at Adelaide Oval! Your membership also gives you priority access to purchase tickets to a range of other special events that take place throughout the year, including concerts, soccer, rugby and more. Fully transferable membership allowing you to pass it on to family, friends and workmates either in-person or via ezyTicket email. Members can purchase up to four Guest Passes per membership barcode, per game (subject to availability). Purchase through Ticketek using your 14-digit barcode number. On-sale dates, prices and quantities are set in conjunction with the two AFL Clubs. The number of Guest Passes available for each game is dependent on factors such as competing teams and timeslot, so get in quick once they go on-sale! Members can purchase up to five Daily Reserved Seats per membership barcode. Multiple membership barcodes can be entered at once for larger groups. Members can select from two different Daily Reserve Seat categories (Level 2, or Level 3/4) and seats are sold as ‘next best available’. Daily Reserved Seats do not permit entry. If purchasing a daily reserved seat for a guest, you must ensure you have a Guest Pass for that game. Any Daily Reserved Seats that remain unsold will be released as unreserved seating on game day. On-sale dates and prices are set in conjunction with the two AFL Clubs. Get in quick once they go on-sale as they do sell out! Season Reserved Seats can be added to your membership for 11 Crows home games and/or 11 Power home games. Season Reserved Seats are currently sold out, and a waitlist has been started which members can join by calling Member Services on 1300 100 336. Please note Season Reserved Seats will be offered to those at the top of this waitlist as they become available due to non-renewal by current season reserved seat holders. An exclusive benefit only available to Adelaide Oval Football Members and Guest Pass holders! Located on Level 3 of the Riverbank Stand, the Leigh Whicker Room provides excellent views of the ground thanks to full length windows that slide open to ensure none of the atmosphere is missed. This is to ensure as many Adelaide Oval Football Members and their guests as possible can enjoy this exclusive benefit, given the limited number of seats available in the room. Leigh Whicker Room seat upgrades do not permit entry. 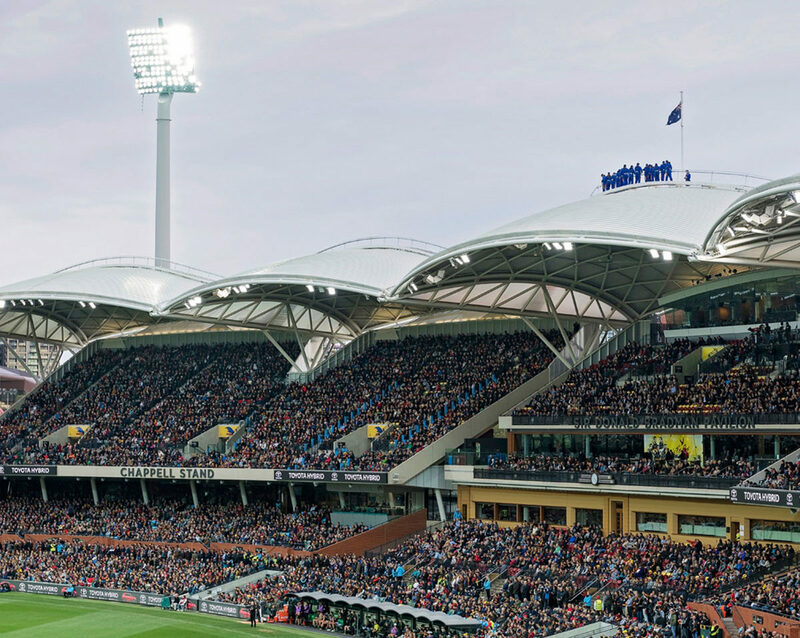 If purchasing a Leigh Whicker Room seat upgrade for a non-Adelaide Oval Football Member you must also ensure you have an additional Adelaide Oval Football Membership or Guest Pass for that game for them to use for entry. Additional Guest Passes and Reserved Seat Upgrades can be purchased prior to the game through Ticketek (subject to availability). Once you have selected your chosen game, please select ‘AFL Reserve’ to purchase your Guest Passes or Reserved Seat Upgrades. MCC Members please note that there is no reciprocal arrangement in place to attend AFL at Adelaide Oval.